J. Rossen, "Women Writing Modern Fiction: A Passion for Ideas"
Many women writers in twentieth-century Britain were fascinated by the individual thought processes of their characters. 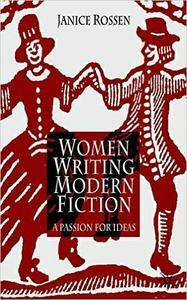 Women Writing Modern Fiction draws connections between the works of authors such as Elizabeth Bowen, Dorothy L. Sayers, Olivia Manning, Iris Murdoch and A.S. Byatt, who dramatize darkness in wartime, gothic terror, madness and romantic betrayal, yet celebrate the triumph of rationality and 'The Higher Common Sense'. With irony, detachment, wit and high intelligence, they bring us acrobatic tales of the mind. Janice Rossen is Senior Research Fellow, Harry Ransom Humanities Research Center, The University of Texas at Austin.